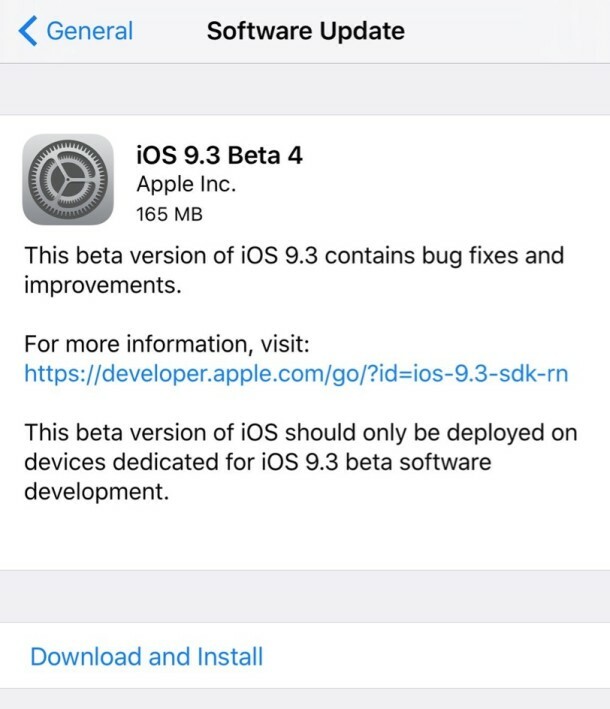 Apple has released new beta builds for each of their operating systems, including iOS 9.3 beta 4, OS X 10.11.4 beta 4, tvOS 9.2 beta 4, and watchOS 2.2 beta 4. The new betas are available now for users participating in the developer beta testing programs, while public beta versions typically follow soon after. Users can download the available updates from the Apple Developer Center website, or through the over-the-air update mechanism on devices running prior beta releases. iOS 9.3 beta 4 arrives as build 13E5214d and includes support for password protected Notes, Verizon wi-fi calling, and the Night Shift feature which changes screen color depending on the time of day (much like F.lux). OS X 10.11.4 beta 4 is build 15E49a, and includes compatibility with iOS 9.3 devices, plus support for the secured Notes feature, and Messages app can now display Live Photos taken from an iPhone. tvOS 9.2 beta 4 for Apple TV 4th generation models includes Bluetooth keyboard support, spoken dictation support for text input, iCloud Photo Library, and a variety of other improvements. WatchOS 2.2 beta 4 resolves a fair amount of bugs and includes an updated Maps application. The final version of each operating system release is expected to arrive on or near March 15, when Apple is apparently going to host an event to unveil an updated iPad and a revised 4″ iPhone. I sure hope it has all kind of new stuff in it so Wharf Xanadu will shut his pie hole and quit crying. I am using Windows today and I’m not going to be a good Mac user since I’m on the PC for work. My iPhone is having lots of bugs, I hope that this finally fixed it. No new features as usual just bugs. iOS 9.4 Hooray. What do you think iOS 10 will be called? What do you think OS X 10.12 will be called? What if they merge them and call them iOS X and iOS X Pro? What do you think of that? That way all the bugs would be on the same platform, haha! Stop moaning. If you’re not happy/ pissed off/ upset/ about something, let them know. Robust PC user, eh? Windows 10, eh? Have you tried it, huh? How is it? Wobbly-shmobbly? Fancy-shmancy? Please take part of the beta-community and use the feedback for e bugs. You put them directly in the basket for the developers. And everyone could have the profit of it. It’s oké to release stream here. But please use the feedback in de the beta. Hmm, maybe copy and paste works relibly? It has not since ios 5. Copy and paste, text selection, don’t work at all, it’s total amateur hour in iOS. The platform is usable but full of bugs. iOS 5 was the last good iOS, I have it on an old iPad and it’s great, lightning fast. Stable. Works beautifully. iOS 6 was slower and buggier. Then iOS 7 came out and it took a nose dive from there. iOS 8 slightly improved, then iOS 9 drilled straight into a cess pool where it has now been swimming for a year, nearly unusable on anything but the latest and most expensive hardware. Begs the question what is going on at Apple. They got rid of Forstall, who was obviously the last person who was able to put their foot down about software quality in iOS. Apple has something like 20,000 employees that aren’t retail, what on earth do they all do? None of them are in software engineering or quality assurance, apparently. Maybe they all just make ugly icons for iOS all day. The Mac is a whole other ball game, full of bugs and flaws, I like Craig Hair Guy Frederighi but OS X is a mess too. I think one person works on OS X, the rest must be doing who knows what. Working on the Apple Car maybe? Can you imagine how stable Apple Car will be judging on the iOS and OS X experiences? Good grief. I’ll stick with Toyota. I bought a MacBook, and do I ever regret that buy. I run Linux in a VM. I plan to move back to the USA next year. I thought about sending a resume to Apple for a chance to take part in fixing things. I do not think I will bother. I will never by the future Chinese made Apple car with all the bugs that will go with it. I sold my fathful Jeep a year after I moved to Singapore. I will buy another when I return to California. Has the latest beta of tvOS fixed the issue where Short Description from self-ripped MP4 files finally show up? Apparently, the AppleTV only pulls the info from Long Description. This update killed all third party (such as Viber, outlook, facebook messenger) notifications to Apple Watch! tried restarting both iPhone and Apple Watch, but again, notifications are not coming to the watch! Every time I land in a new airport I have to power cycle my iPhone twice to get to the local free WiFi login screen. All the Apple people are fustrated, but the Android people can connect immediately. I suppose the problem will never be fixed. I’m always entertained by the comments on articles like this when they turn into a complaint thread. I have personally had none of these issues, so at least one person is able to use current versions of iOS on a wide range of (new and old) devices. FWIW, 9.3b4 on my iPad Pro showed some crazy lag stuff when I was on a filtered guest WiFi at a customer location. However, the Night Shift works well, copy/paste work flawlessly (as they have on every release of iOS since it was introduced), and it mostly “just works.” I do wish they’d address the keyboard “auto select” for those of us who touch type. It’s frustrating when fast typing leads to selecting the word just typed. This beta seems better, but it’s still doing it (and did a few times as I typed this comment). I installed this on my iphone this morning, notifications with apple watch are no longer working as expected. Previously if the phone was locked notifications only came thru on apple watch, however since this beta was installed im now getting notifications on both devices are the same time.